Round 2 brought all the fun things of round 1 with a bit more flu like symptoms and fatigue. My momma came with me for this round which was great to have her with me. I know it can’t be easy watching your child be administered toxins. But she was a trooper! Unfortunately this go round they went right back to the same spot for my IV and wouldn’t you know it, the days to follow would reveal that area is now scarred. Dr Tweed advised that we will be switching around veins in order to try to keep me from having a port. I’ve also been prescribed Prevacid for the God awful heartburn I’ve had every single day. I have literally felt like my stomach and throat have been on fire! Everything I eat or drink causes it and it just gets worse. I’ve also had terrible tension headaches which I will be trying to prevent by getting either massage or acupuncture done following treatment. My chemo brain is getting worse. I can’t remember anything, which is one of the reasons why I am so late on posting again! I keep meaning to do it but forget all about it! 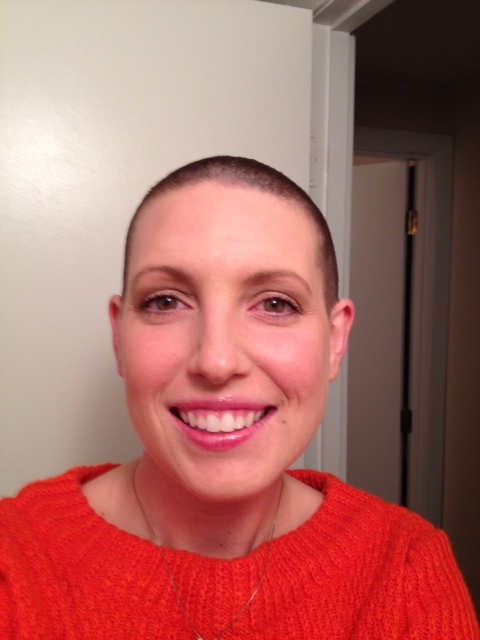 Major thing that happened this week: My husband shaved my head because my hair began to fall out. I thought this would affect me more but it didn’t. And I think this was because I had taken the steps to cut it short first so shaving it was just going a little bit shorter! I keep people at work guessing as they never know what Amber is going to walk in the door, short hair, long hair, scarf etc. I like to keep them guessing. This weekend my parents, sister in law Heather, nephew James, my Aunt Audra, Uncle Pat, cuz Ashley (Tank & Raven) came over to hang out and help Chris work on our new house. As usual, James kept us laughing with all his witty commentary. Sure going to miss them when they go back to NC this week. Chemo Round 3 is this Friday and I am going to do my best to try to log each day. I said I wasn’t going to sugar coat any of this and leaving out details is not doing my blog any justice. So next week prepare yourself for the dirt and grime! I’d like to accompany you to a treatment session. Let me know. I’ll make arrangements!! Loves you!! Being there with you for Chemo was not easy. Watching your child have to go through these awful procedures is painful to my heart. Knowing there is nothing I can do to fix this is painful. But being there for you is what I can do. Be it Chemo, surgery, haircuts or making dinner. I love you with all my heart. We will squash this cancer My Babygirl!!! Love your Momma. You look great! You are such an eloquent writer and I love your blog. Keep on keepin’ on, girl! Love you.